An AppExchange Package that allows you to add custom objects into your Salesforce layout. These custom objects will then be populated with information from the AdvocateHub. The integration with SFDC will enrich your advocate data in your AdvocateHub with SFDC data. This additional data can be used to segment your advocates and better target which advocates should receive certain challenges as well as automatically adding to Groups. Surface a list of Advocacy Activities completed by an advocate on their contact record in Salesforce. Learn more about Viewing Advocacy Information In Salesforce. You're about to call a customer and you know that they are an advocate. You want to recognize them for what they've done. When an advocate completes a challenge activity, redeemed a reward, made a referral or performed other activities, you can display these activities on the SFDC Contact Record. This will give your front line customer teams like Account Managers the visibility they need to properly recognize advocates during their regular meetings or especially contract discussions. Allow Salesforce users to nominate Salesforce contacts to become advocates. Learn more about Nominating Contacts In Salesforce. Connecting SFDC and Influitive will allow any SFDC user the ability to recommend potential advocates (called "nominees") that should be added to your AdvocateHub. This is typically done by adding a nominate button to your SFDC contact record. You can decide if you want to automatically send out an invite to these newly added nominees or review these contacts first and send a more personalized invitation. Allow advocates to suggest referrals that are then passed into Salesforce. Learn more about Referrals 2.0. Your sales team always wants qualified leads. One of the great benefits of the AdvocateHub is that it easily allows you to put your advocates to work to generate referrals for your sales team. The AdvocateHub expedites the process by seamlessly passing these leads to SFDC and updates the SFDC lead source to "Influitive" so you get the credit! Report on advocacy within Salesforce. Check out these Salesforce Dashboards for inspiration. 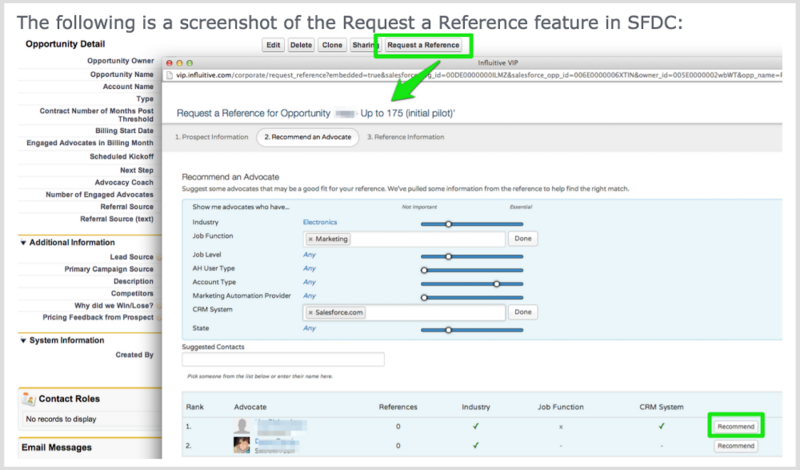 Allow Salesforce users to request a reference call with an advocate for an active opportunity. Learn more about the Reference Request Feature. Have you had a sales rep come to you needing a last-minute reference? Of course you have! SFDC users can easily request that a reference challenge is created in your Advocate Hub. On the SFDC Opportunity record a "Request a Reference" button can be added that will allow the SFDC user to simply notify your Advocate Hub administrator that a certain type of reference is needed or allow the Salesforce.com user to create the challenge themselves. Reps can customize the requirements for their reference and narrow it down to a reference that meets their specific needs. So if you have Salesforce, don't wait to take advantage of these great features. To get started, be sure to review the AppExchange Package for AdvocateHub Installation Guide.